Jiří Bělohlávek's impending departure from the BBC Symphony Orchestra and appointment to the Czech Philharmonic have been covered. But his move from IMG Artists to the China based Armstrong Arts management agency has slipped under the radar. The little-known Armstrong Arts has a small artist roster that includes Barbara Bonney, Krzysztof Penderecki and the Chinese conductor Da Ye Lin. But the commercial-intermediary complex have been quick to close ranks. With Bělohlávek currently sidelined by a virus (Hong Kong flu perhaps?) his place at the BBC Prom on August 22 accompanying IMG Artist Barry Douglas has been taken by IMG Artist Thomas Dausgaard. Amazing how nothing is lost, even in infection. Amusingly put, but isn't arranging a replacement for an indisposed artist something an agent would be contracted or expected to do (and the replacement would reasonably enough come from the agent's client list)? 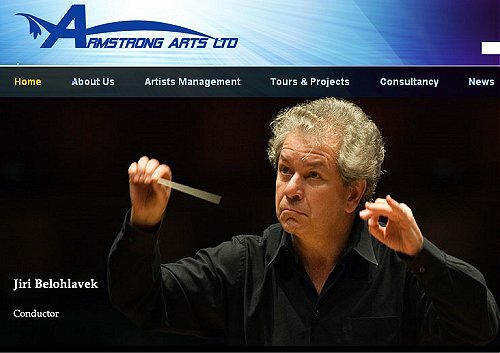 Armstrong Arts lists Bělohlávek as "in association with IMG", and Penderecki and Bonney (hasn't she effectively retired?) as regional representation, which seems fair enough. And if any professional groups should be allowed to have an income level generous enough to run a Lamborghini (that can, of course, be debated), I'd put conductors in front of bankers. Jonathan Nott doesn't come across as one of the bad guys of the conductor circuit, and he even seems to have a sympathetic attitude to letting others drive his petrol-guzzling monster. In connection with the first comment. Armstrong Arts may list "Bělohlávek as 'in association with IMG'". But IMG do not list Bělohlávek at all.